The Auspedic AP-1010 Massage Table is the ultimate beginner's table. Includes free Carry Bag. 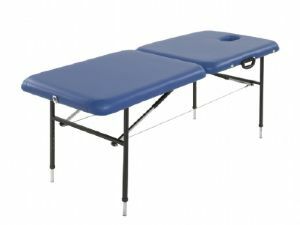 This is our entry level table and as such it has been priced extremely well to bring it into the budget of every massage student. With its solid metal construction this table has the strength to last for years. With its adjustable height legs (as demonstrated in the image on the right), this table has been designed to suit a large range of heights and because it can adjust it can be easily sold when you decide to upgrade. The table can be setup and folded away in seconds for easy storage. When folded the handle on top makes for easy portability.